I got funny looks from my girlfriend and I definitely creeped out the waitress, but the kid inside of me teamed up with the sports nut and took over. I was at their mercy. It was getting late Saturday night after the U.S. had been eliminated from the World Cup, and my girlfriend insisted I begin to cheer up (women, huh?). We decided to go out to eat. I made my way towards Red Lobster on Maple by the Boulevard, and somewhere between the indecisiveness of women, heavy traffic and my lack of patience…we ended up at Tully’s on Main and Transit. Clearly, I was aggravated by the time we got to our seats, and to make matters worse, the soccer game was being replayed on every other television. It was too hard to watch, and I ended up putting my head down on the table to get away from it all. And there they were, baseball cards in the table. How cool was that? It’s not that hard to do, but I liked what I saw and it took my mind off the game. I read off the names in front of me, and, making small talk, I asked my girlfriend who she had on her side. This table has some good players, I thought. I read off more names. This table has some great players. And just like that, I was gone. I was moving ketchup bottles and napkin holders to read off every card on that table. By the time I finished I was certain this table had to be the best table ever in the history of a restaurant. My starting rotation was solid. To the couple behind us, I’m sorry I interrupted your meal when I raised my voice, but my girlfriend told me she didn’t know who Nolan Ryan was. You can see where I’m coming from. 2. Roger Clemens. Another pitcher who needs no introduction. I think he’s innocent on the steroids, but that’s another story. 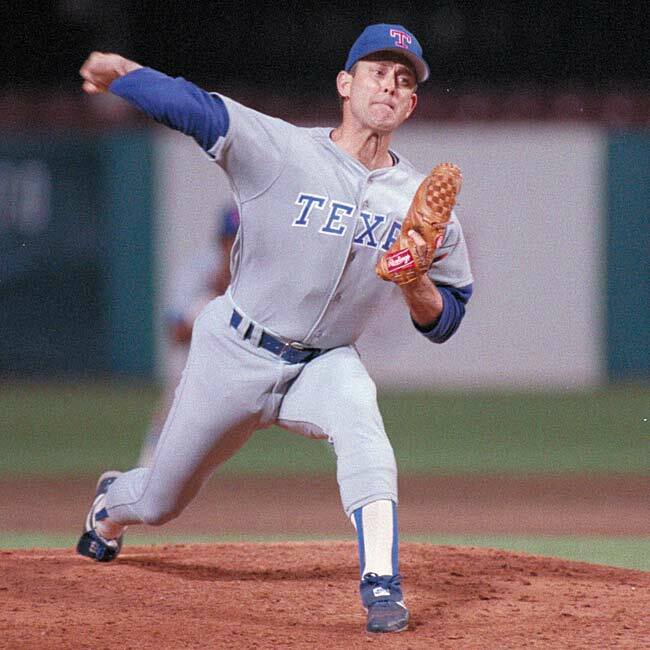 Seven Cy Youngs, third place all-time in strikeouts and ninth all-time in wins. Big game pitcher. 3. Orel Hershiser. Baseball Tonight host, a career batting average above the Mendoza line, and he was born in Buffalo. In 1988 he won 23 games, the Cy Young award, a Gold Glove, and was named World Series MVP. What’s not to love? These cards were great. Not Honus Wagner T206 great, but pretty darn good. 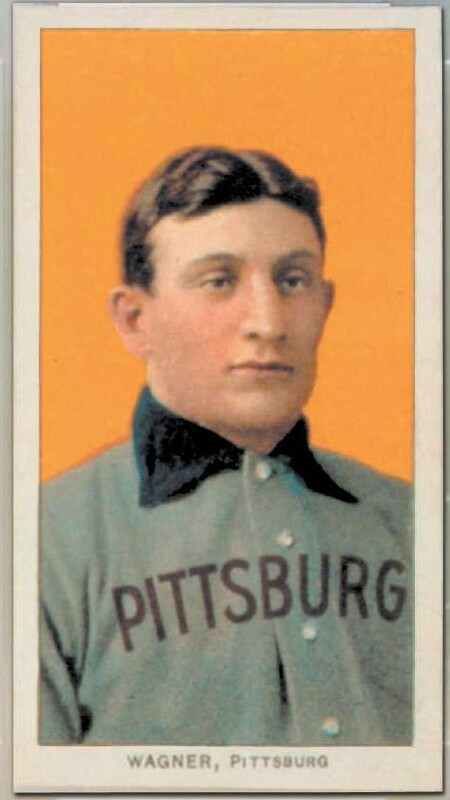 Note the age of the card; Pittsburgh didn't have an "h" at the end. 4. Dave Stewart. AL All-Star in 1989 who led the league in games started four consecutive seasons (’88-’91) and owns a post-season ERA of 2.77. 5. Mike Moore. Number one overall draft pick in 1981 and was another member of the AL All-Star team in ’89. In relief, I can call on either Tug McGraw or Jesse Orosco. Orosco is the all-time games leader for pitchers, while McGraw owns a 3.14 lifetime ERA and was one of the best character people in the game. After my pitchers put goose eggs on the scoreboard, I’m going to need some run support. My lineup is just as deadly as my rotation. 1. Leading off is Hall-of-Famer Wade Boggs (3B). Led the league in on-base percentage six times and hit .328 for his career. Won two Gold Gloves and was a 12-time All-Star. 2. Batting second is HOFer Tony Gwynn (OF). Led the league in batting average eight times and was a career .338 hitter. Not known for his power (135 HRs in 20 seasons), but struck out only 434 times in over 10,000 plate appearances. 3. Third is HOFer and 10-time All-Star Ryne Sandberg (2B). Has over 1,000 career RBIs to go along with a .285 career batting average, and slugged over .500 four times. Also owns nine Gold Glove awards. 4. Cleaning up is none other than Hank Aaron (OF). Don’t know what his card was doing in a table (must be a reprint), but he can hit cleanup for me any day. Still the all-time home run leader in my eyes with 755, Hammerin’ Hank was named to the All-Star team 21 times and is the MLB career leader in RBIs with 2,297. 6. Catcher was the only position I didn’t have on the table, but Kevin Mitchell will have to do. We’re hoping to get him in 1989 form, the year he won the MVP after hitting 47 homers, slugging .635 and knocking in 125 runs. 7. No easy out in the order. Seventh is Wally Joyner (1B), who hit .280 or better 11 times in his 16-year career. 8. Miguel Tejada (SS). Gives power and speed to the bottom of the order, and can get on base for when the top hitters come back up. 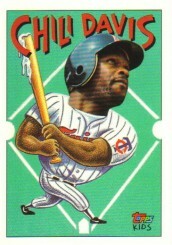 Twice led the league in doubles and once reached 150 RBIs. Is a six-time All-Star and owner of a .289 career average. My bench players (or DHs) are Jose Offerman and Chili Davis. Offerman is a two-time All-Star who twice led the league in triples. He once stole 45 bases, so he could pinch run late in games too. Davis was a three-time All-Star… and who doesn’t love Chili Davis? So that’s my roster. No rhyme or reason for doing this, but it was fun and it killed time before my meal. Definitely took my mind off U.S. soccer losing, which I am very thankful for. I wonder if other tables have good players like this too. In the rare event that you read this and are going to Tully’s later, make your roster and comment it below. I mean, my team would kick your team’s behind with blindfolds on… but it would still be fun. Stephen Strasburg is due for a Carlos Zambrano-sized fit if he doesn’t start getting more run support. One of these days he’s going to shut the other team out on the mound, then get on base and help himself out like he did against the Bisons. In his two wins, the Nationals have scored a combined 14 runs, but in his two losses? Zilch. 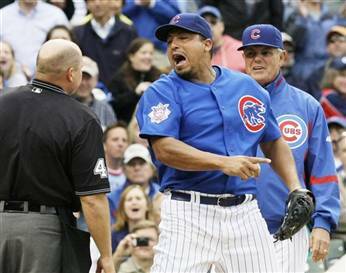 Speaking of the Carlos Zambrano situation, I think the Cubbies need to take five and chill out. I’m fine with him going out to dinner with White Sox’s manager Ozzie Guillen hours after it happened. If anybody has experience with losing their temper, it’s Ozzie. I’m sure he had a pointer or two for Big Z about the course of action to take to make things better between him and his ball club. And what’s the worst that could happen? Ozzie woos Zambrano and he signs with the Sox? That would do the Cubs a huge favor, getting rid of a mediocre pitcher with a big salary. I’m slightly confused on the AP style for all time versus all-time, so I just kept it consistent. It reads “An all-time high, but the greatest runner of all time,” with no further explanation.